With two outs in the top of the fourth inning, defending champions Pirates led the Reds 12-0 in the opener of the BVI Softball Association Juliette Penn League on Sunday night and were on the verge ending the game on the mercy rule, before the Reds broke up a no-hitter and scored four runs on three hits. The league opened in honor of Penn, the current Supervisor of Elections and a former third baseman who became the association’s secretary in 1981 and served for the next 26 years. Pinch hitter Ricky Clendenin lined a clean single up the middle to break up NIcos Penn’s no-hit bid and the Reds got an additional two hits in the inning to score their four runs, cutting the deficit to 12-4, before they went on to fall, 13-6. The Pirates’ 13 runs came off 11 hits and they had 2 errors left 2 runners on base. The Reds countered with 6 runs, 3 hits an error and they stranded seven base runners. 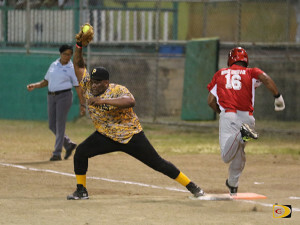 Penn picked up the victory while veteran Roy “Panhandle” Hill, the league’s oldest player who will be 66 this year, took the loss. Kye Rymer was the Pirates’ top hitter, going 3-for-3. Levron Sauraw went 2-for-2. Tramore Fraser, 2-for-4 and George Borrows, 2-for-3 with 3 runs scored. In the opening game, powered by three Jheane Niles homers on a 10 RBI afternoon, the Hawks walloped the West End Warriors, 20-3. They scored five runs in the second inning and 15 in the third, where Niles connected for two of her three homers and seven of her 10 runs batted in, including a grand slam. The Warriors’ two runs came in first of the three innings game. The Hawks’ 20 runs came off 17 hits, 3 errors and they left 2 on base. Laura Issac was the winning pitcher and Daphne Smith took the loss for the Warriors whose 3 runs came off one hit. The stranded 6 and committed an error. The Hawks’ Michelle Georges had a 3-for-3 game and scored twice. Miranda Marie, finished 2-for-3 with 3 runs scored and 2 RBI’s. Judith Harrigan had a 2-for-3 game, scored twice and drove in two runs. The Warriors’ Kemesha Adams had their lone hit and two at bats and scored in the first inning.